Crosswinds provides a fun, relaxing and family oriented atmosphere for all of its boaters to enjoy. There is plenty of convenient parking and the Hart / Montague Bike Trail is just across the street. We are only a short walk or bike ride from both of the unique downtowns of Montague and Whitehall. Or if you are looking for a break from the water, take the trip along Scenic Drive around White Lake, past Duck Lake and Lake Michigan. Scenic Drive is a great path to see some beautiful sights through Muskegon County. Our Bathhouse and Laundry facilities are one of the cleanest up and down the coast. They offer tile restrooms, coin operated laundry, and a gathering area. We take great pride in our facility and look forward to continually giving our boaters that best experience on White Lake. 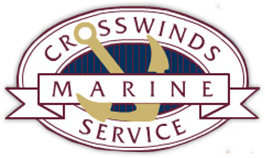 Some other added conveniences that you will find at Crosswinds Marine Service is the ability to fuel up at our full service gas dock. We are the only marina on White Lake to offer 100% marine fuel that contains no ethanol. Learn why ethanol is bad for your boat here. We also offer a pump out station and a fish cleaning station with stainless steel surfaces for when you catch the big one.